A web series about love, friendship, neuropsychology, and zombies. 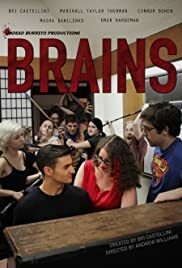 "Brains" is a 10 episode web series set after a three year zombie apocalypse on a college campus. 23-year-old Alison Sumner is a neuropsychology student with a zombie (Carl Markham) as a best friend, who spends her time doing research about the zombie plague and crushing on a fellow student (Damian Phillips). Alison "vlogs" her quest to seduce her crush as an independent study art project, but as the series goes on, it becomes much more an account of her life post-apocalypse and, eventually, a murder-mystery.